Well this has been escalating quickly! the Arch looks interesting too! "LZX Industries: Yes, it is! The XY axis of the joystick controls the point in the hue/saturation space of the input image where the chroma key is centered. Diameter controls the range of neighboring colors surrounding this point which are allowed to contribute to the key, and Fringe controls the degree to which these neighboring colors contribute to the output, based on their distance from the central point. This is all done with analog circuits, no hard keys/comparators." Yes, it does indeed look like an expanded compositor section from the VC. It really opens up the mixing possibilities. I also like how Arch expands the logic operations. Minimum is 'and', Maximum is 'or', and it looks like Absolute will give the 'xor' function when the Negative switch is on. Imagine feeding the outputs into the Opacity inputs on Marble Index! Nevermind the other Arch functions. So very tasty! It's a shame I'm on the wrong side of the Atlantic, otherwise I'd preorder them all. Well, maybe a UK shop will offer that option. "While both can mix RGB signals together, they're quite different. One is a matrix mixer (giving you manual level control over each individual input color), and Marble Index is more about voltage controlled mixing between sets of RGB inputs. 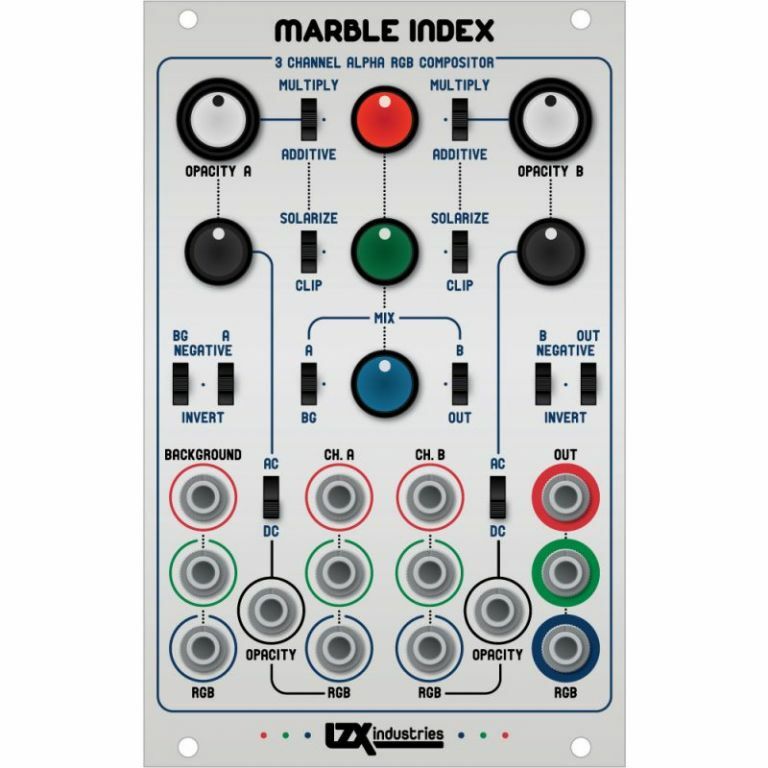 On top of this, Marble Index has a LOT more circuitry related to complex blending modes -- so it's kind of more like an analog computer designed to achieve compositor math typically found in computer graphcis. I'm not sure if anything like it really exists... trying to do something totally new. You can think of Marble Index more like a video mixer, except instead of A/B banks you have 3 layers, and instead of an A/B fade control, you have 2 opacity controls." was that answer just from facebook or something more like a personal message? Yeah, I get the impression that you'd need 2 VCs chained to get something like the MI. So comparing it to the VC misses this - you can still feed the MI into a VC. In fact, you could feed *2* of them into a VC. That might be like using *5* VCs, which would be insane. Of course, if the MI does something that a pair of VCs can't do, then it's even more wild! The VBM/MI comparison is even more extreme, I think. You could have 2 or 3 Color Chords going into an MI, then into a VC. How many people have more than 1 CC? I have 1 and I just sold my VBM, intending to buy a 2nd VC (coz I have 2 cabs now). Now I'm reconsidering that. Sure, I could use the extra inputs, and maybe even a 2nd output, but...that can wait. I can just put all the modules that need sync in the same cab as the VC, then slowly fill the other cab. Why must so many come out at the same time? Perhaps a partial answer to your question? "It's mainly an economy of scale. LZX is growing from a phase where most of our time has to go into new product development in order to make the business work, to a phase where we have enough product in stock and sales are good enough to provide resources for extra projects. And we want to focus those extra projects on user resources/support ... This is why you've seen such a cavalcade of new releases over the past two years. Our capabilities generally scale based on how many concurrent modules we can keep stocked and actively supported, and providing a nice range of modules for people to build systems with." Yes, I'm aware of the economic argument, but I was speaking as a consumer. Also: I was joking more than complaining. Still, until 2015, no shops in the UK sold video modules. 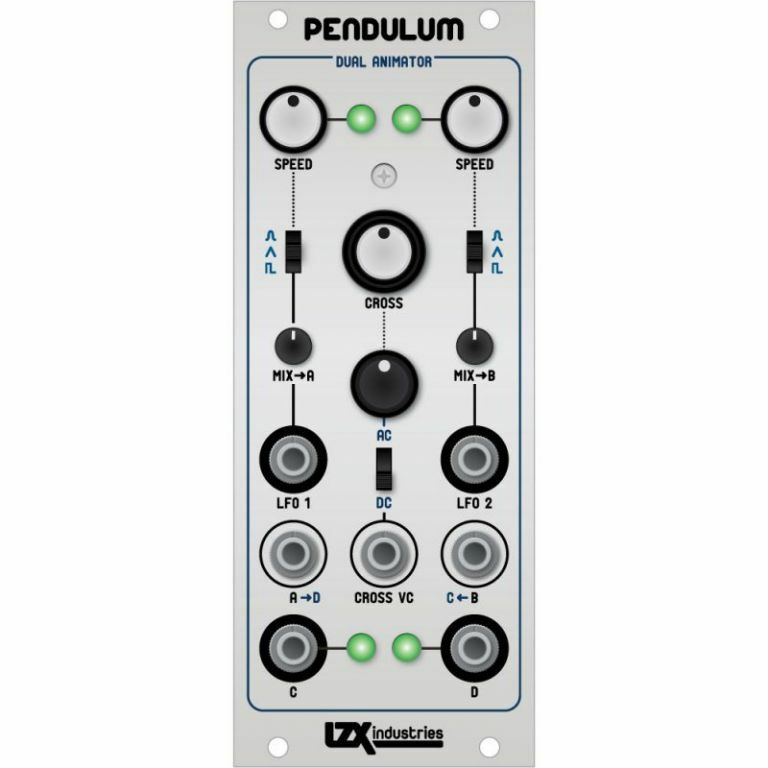 Now the UK has 3 shops, that I know of, selling video modules (London Modular, Rubadub and Signal Sounds), and they restock much faster, so a series of "small" orders will be less risky than it used to be. Sure thing, I took your post with the emoticon you included. Wow. That must've been tough times when no one was selling them. How'd you start your system with that situation? I had to order from the US. Mainly AH but sometimes LZX directly. I can't do that anymore. It's way too expensive now. 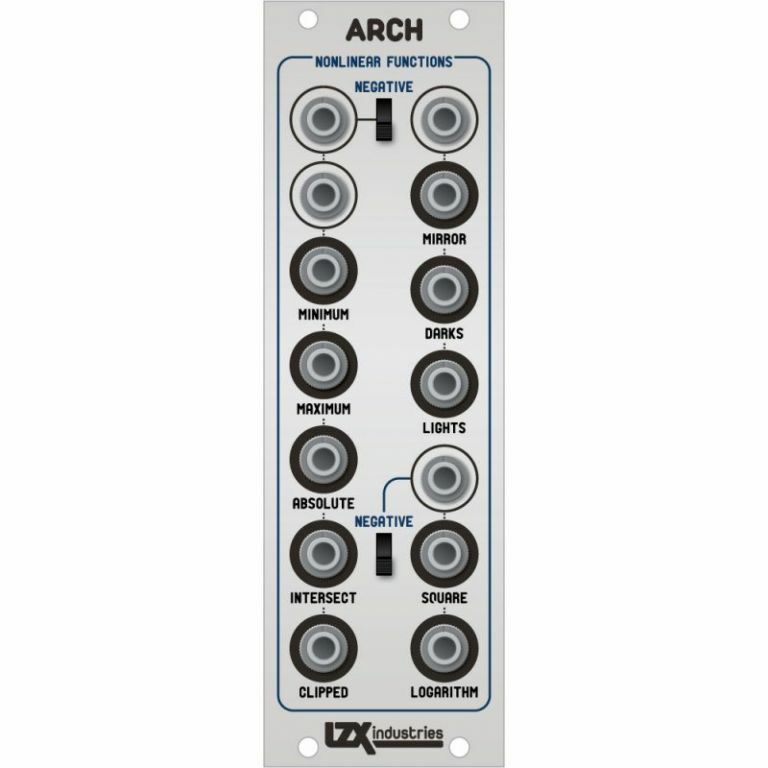 So I can't pre-order any of these modules. All I can do is wait for a UK shop to stock one or more of them. we have a community theatre that puts on 6 shows a year and in april we will be doing willy wonka and the chocolate factory so we have big plans for the video synth to be involved! This sounds really cool. Eager to see some video or stills from that adventure. One more RGB/color tip: Since RGB are separate signals, you don't necessarily have to patch them or use them AS RGB colors. 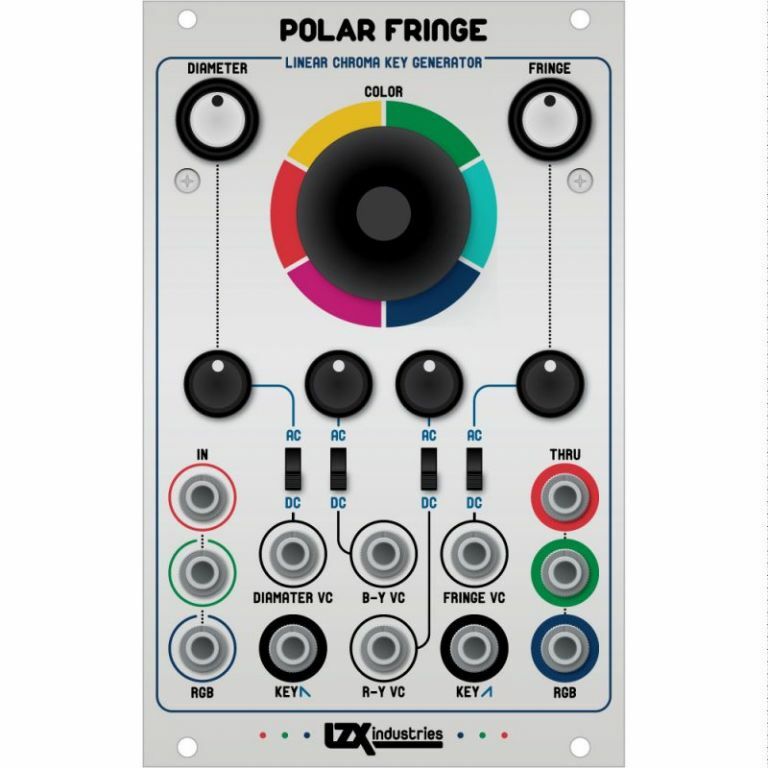 All the RGB modules could be used instead to create multiple monochromatic elements instead, that then get mixed and composited in different ways afterwards. I'm just pointing out that instead of treating, say, Color Chords, as an RGB mixer/colorizer, you could instead treat it as a 3X3 Matrix mixer for general purpose matrix mixing of any kind of CV, shape, key, whatever. To put it another way, audio is not sound until it hits a speaker. And the red channel is not actually red until it hits that final output encoder and then a display. Until then, you could call it "bob" instead, and use bob in all kinds of different ways. Yeah, I don't normally read that group either. So when I do, I find nuggets like the above quotes and save them in a file. I now have a folder with files on various subjects of video synthing. If we had a video synth wiki, we might add them there. Anyway, I can browse these "notes" for ideas and reminders. It saves me the bother of looking at FB more than I absolutely need to. I'm considering this as a voltage processor. Can someone explain what the 3 sections do in terms of actual voltage or waveforms? My assumption is that the input is 0-1v for all. 2-input,​ ​5-output​ ​wideband​ analog​ logic. Binary logic can only see two colors: black and white. Analog logic processes the continuous grayscale range of your analog signal path, enabling organic combinations of images in novel ways. This part makes little sense to me prolly because I'm thinking in Boolean terms. How does "MIN" equate to "OR", "MAX" to "AND", "ABSOLUTE" to "XOR", and what does "Intersection" and "clip"mean here in the Video realm? or more directly, if I insert a part of voltages that is the truth table that comes out of (A, B) to each output? 1-input,​ ​3-output​ full​ ​wave​ rectifier​ ​and​ frequency​ ​doubler. We love this circuit – you can find it in the signal paths of Staircase, Shapechanger and Navigator. With an input triangle wave, you get a triangle wave at double the frequency at your output. Less than clear to me what this does. It looks like "Mirror" is a Full wave Rectifier. "Darks" and "Lights" I can't tell what it a actually does. An infinitely usable function, gamma processing adjusts the brightness of mid-gray level while keeping black and white points consistent. The square function darkens grays, and the log function brightens them. Lars posted this recently on the LZX FB group page. Perhaps it answers some of your questions?